← Boise Should Be in Kansas! 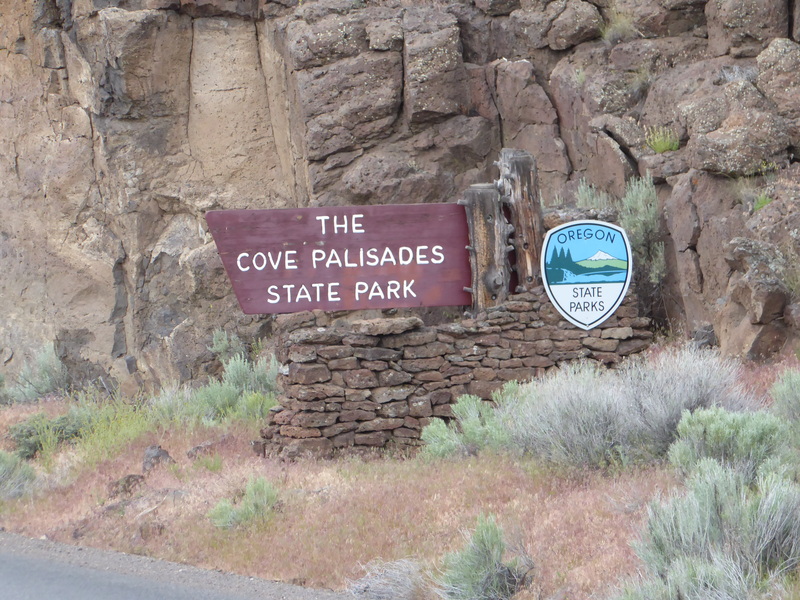 We are in the middle of our volunteer gig at The Cove Palisades State Park in central Oregon and it is going very well and very quickly. 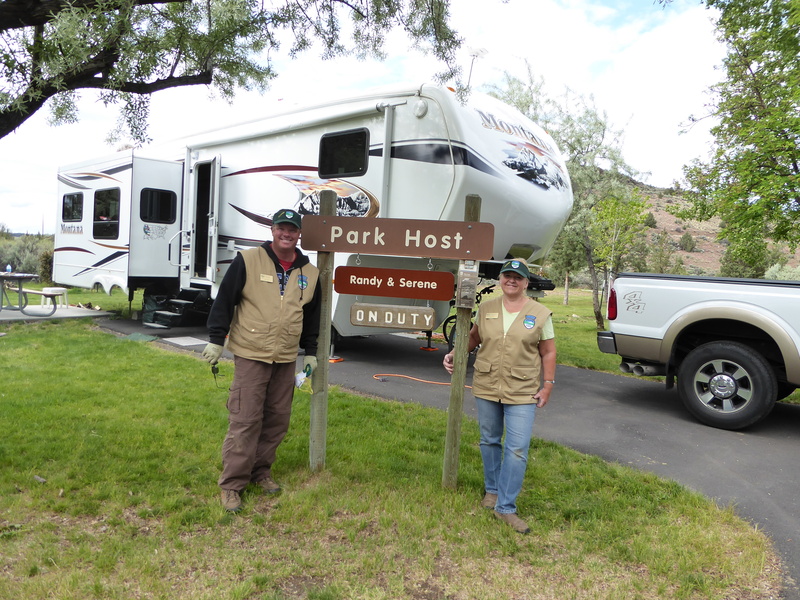 We are camp hosts in the Crooked River Campground and some days we work long enough and hard enough to actually be stiff! 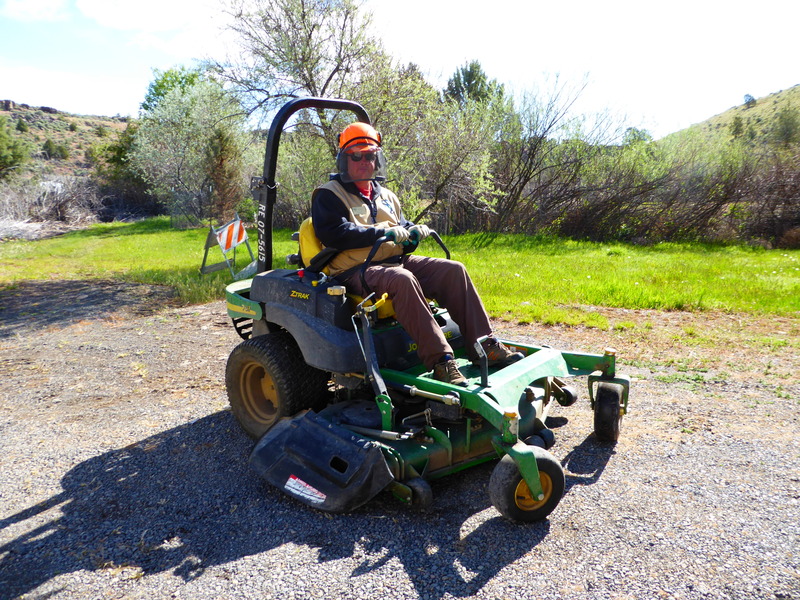 Randy is doing a lot of seasonal prep for the campground and enjoys “playing” with all their power toys like the Z Track mower. 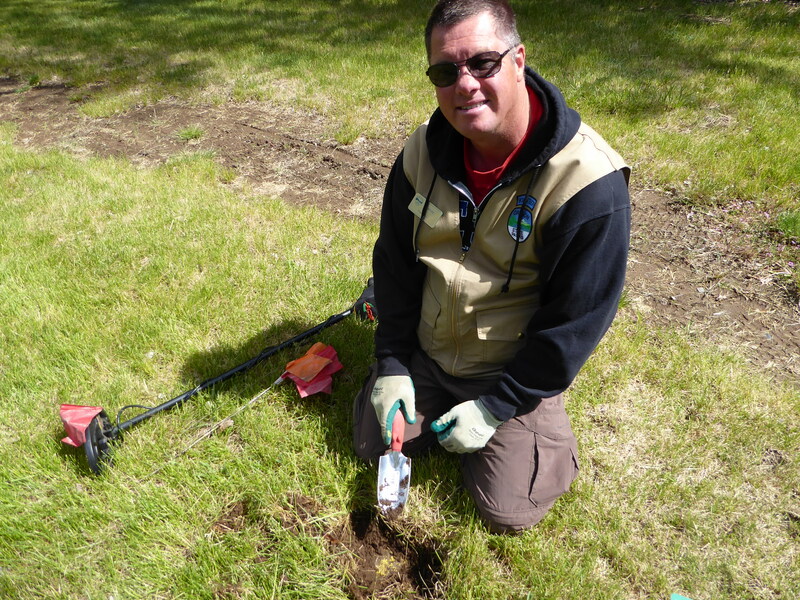 He has also used one of his own toys, his metal detector, to find irrigation couplers which have been overgrown by the grass over the years. 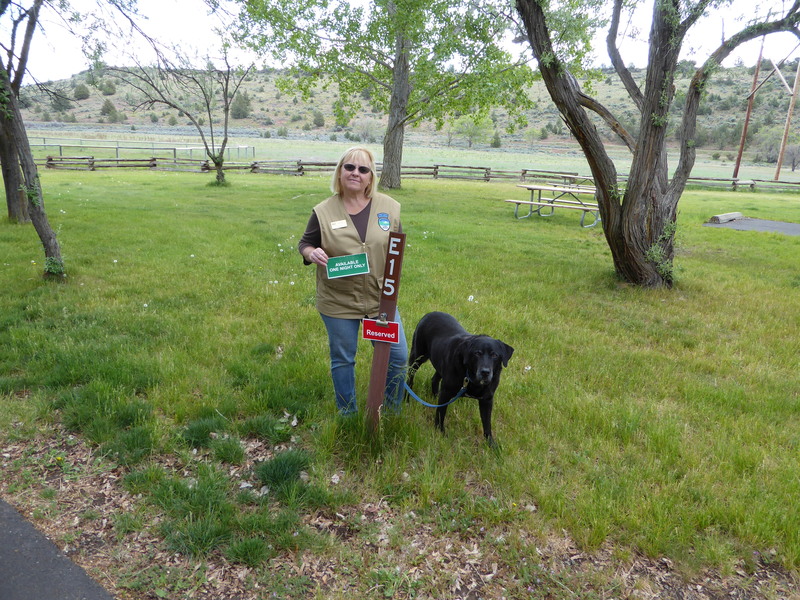 In the mornings, Elko helps me change camp site signs to reserved or available. 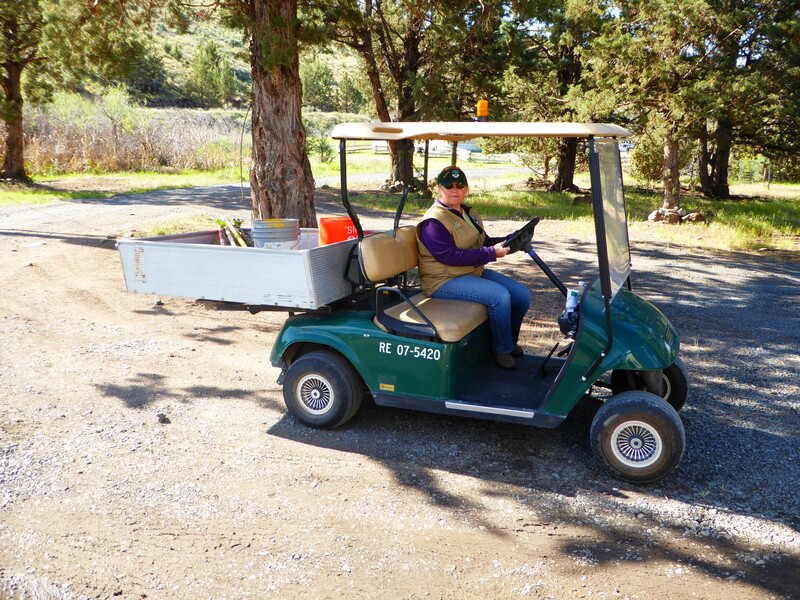 I enjoy running around in our golf cart and specialize in cleaning fire pits. We have a nice camp site with very good satellite access, acceptable Verizon data service and really poor voice cell service. It is nice to have lots of green grass – even if it is part of our job to keep it watered and mowed. From our site we see almost everyone who comes in and out. 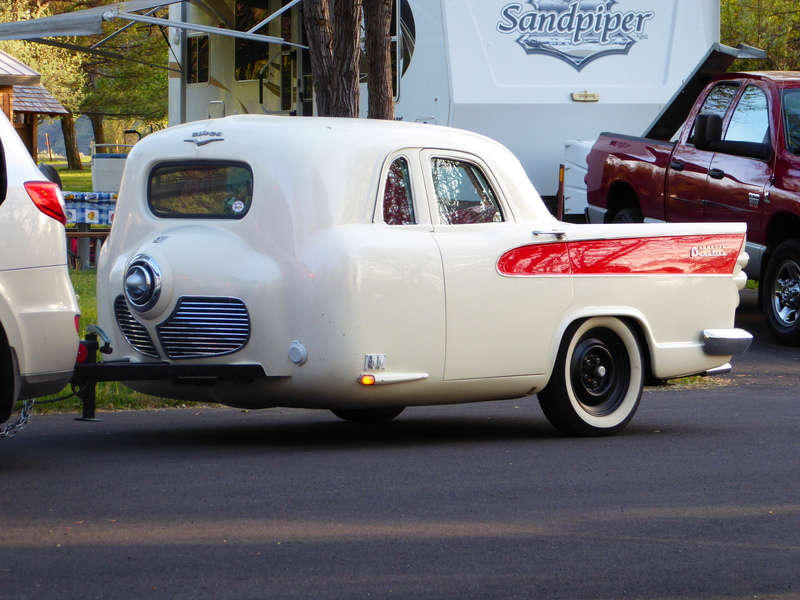 We have seen some interesting rigs, including this custom “trailer” made from parts of 10 different cars. 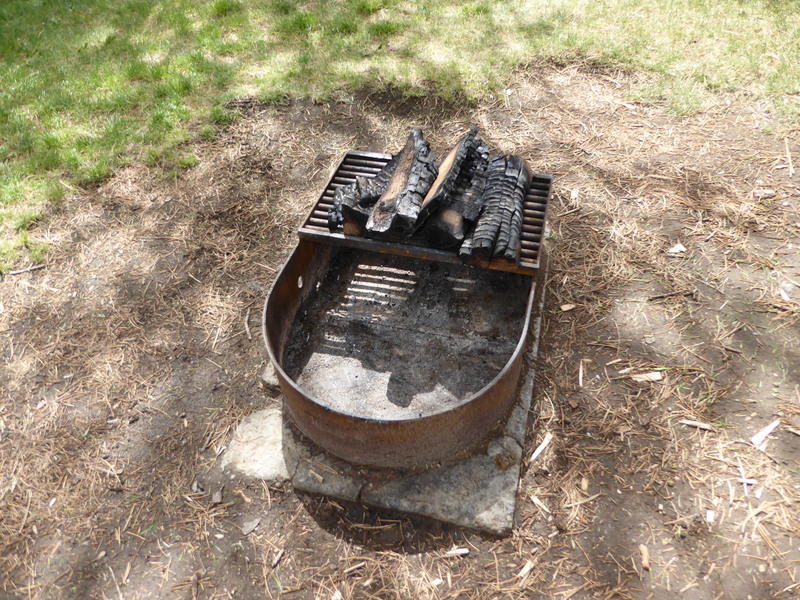 We have enjoyed meeting many of the “guests” in the campground. The weekends are busy, but during the week we have plenty of time to chat. We have met lots of interesting people including two separate couples from Germany. 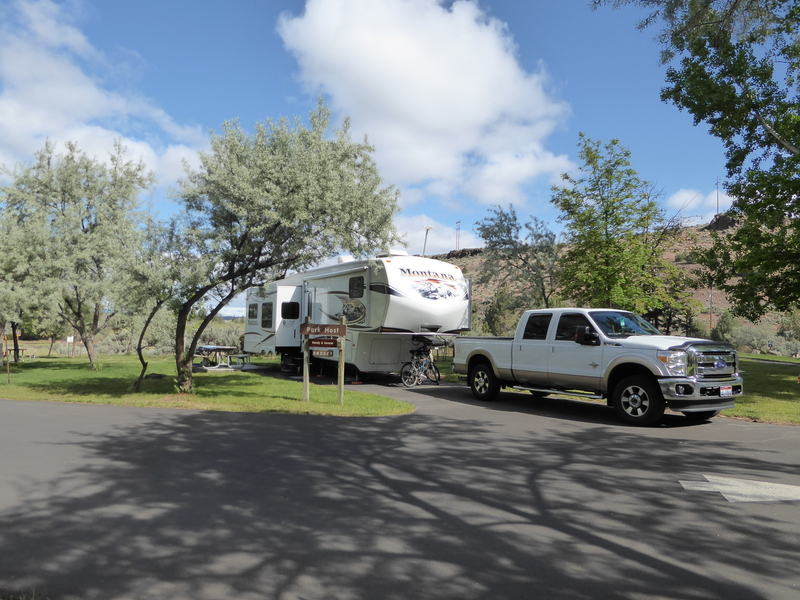 One couple rented an RV to tour the US and the other had their own German motorhome shipped here, via Argentina (after spending time there last year). We have had days off during the last couple weeks. The weather has been hit and miss, but one nice day we went on a hike up onto the peninsula bluff, a 7 mile loop trail called Tam-a-Lau. After not seeing the dreaded snake in all of Arizona, it took no time at all to see one in Oregon. It was slithering across the trail during one of the brief times I was leading our trio, but I survived. 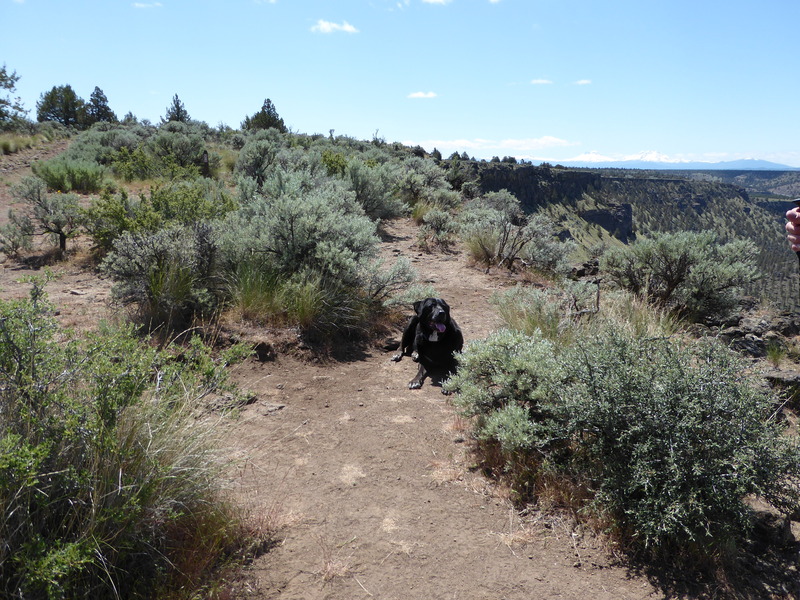 Elko wasn’t impressed by the view. From this side of the bluff, we had a good view of an extension of the peninsula called The Island. 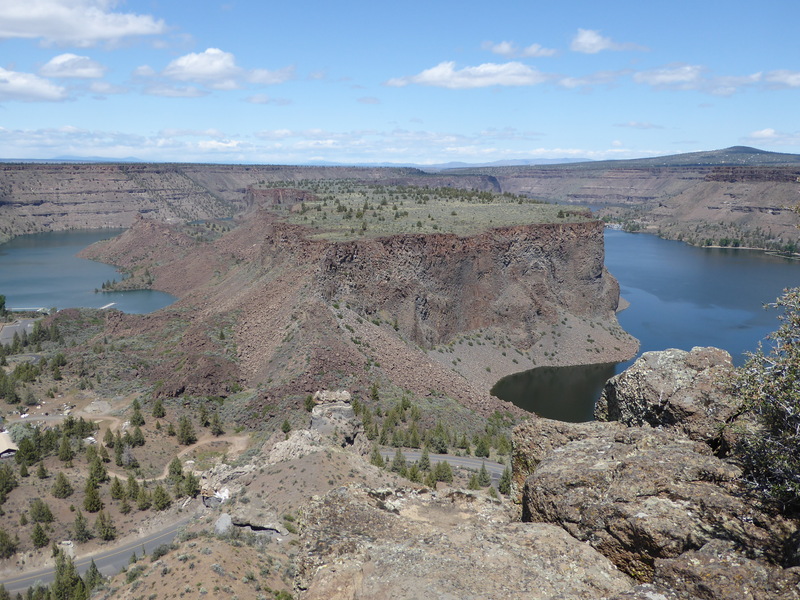 The Island has steep vertical cliffs on three sides, rising 700 feet above the Crooked and Deschutes Rivers. It is about 200 acres on top. Due to the steep cliffs, the Island was only grazed for one season, by sheep, in 1921. It has not had any sizable wildfires in the last century. As a result, the Island has one of the United States’ last remaining undisturbed areas. It is a Nation’s Natural Heritage Site and was designated a Research Natural Area by the Bureau of Land Management. It was closed to the public in 1997. We have a few more days off before we leave at the end of the month. 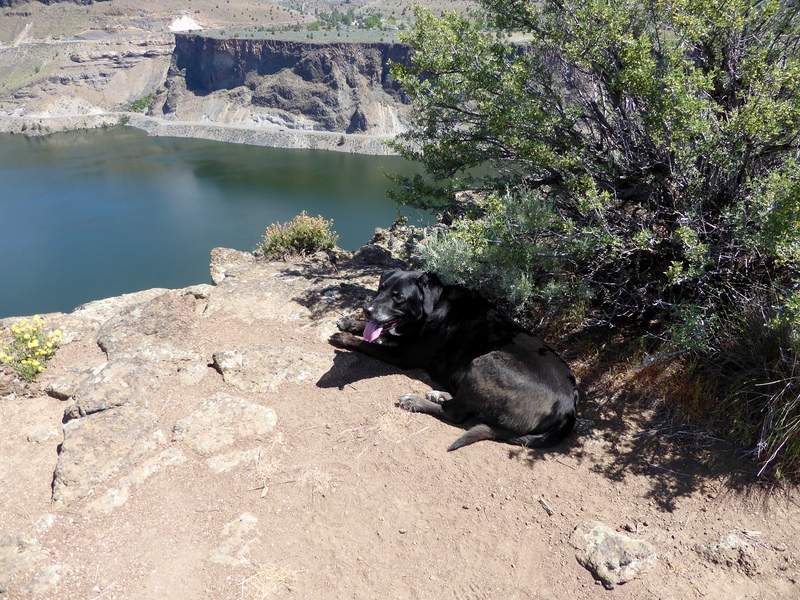 We hope to have some good weather to explore more of central Oregon’s high desert, but if not, we are still having a blast being working stiffs again. Hello hello to my favorite hosts!!! Missing you both around the Crooked River Campground. Hope you’re enjoying all your adventures wandering around.